This site provides information about Chagall, the sale of his graphic work, certificates of authenticity, works on loan and sharing other forms of knowledge on Chagall and his chart. From the Wuyt Collection, the gallery was set up at the end of the last century. A large part of our works can be found on the page Wuyt Collection. 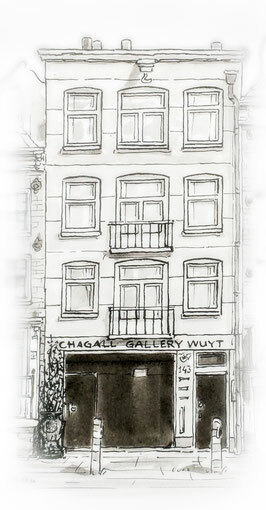 A view hundred works can be found in the drawers of Chagall Gallery Wuyt at Spiegelgracht 32. The larger-sized works found their place in the Research Centre at the Lange Leidsedwarsstraat. Our Research Centre focuses on the acquisition of knowledge of Chagall's life, his graphic work and his stained glass windows. The research is mainly made possible by the Collection Wuyt, which consists of books, documents and graphics. We provide various services including lending work, carrying out authenticity tests and providing certificates of authenticity. The heart of the Research Center lies in the study of Chagall's life and his graphic works. In thirty years this has led to nearly five hundred papers of lectures, introductions and workshops throughout the Netherlands and occasionally outside of these borders. Fifty times a publication appeared, which can be found here by year. 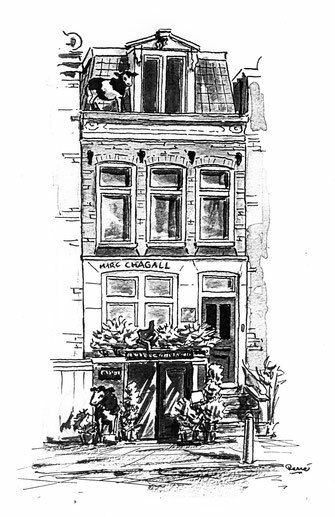 For further information you can contact info@chagall.nl. We intend to regularly place (the framework of) such a publication on the website. Read the latest PAPER OF THE MONTH here.